If you drive a Countach and drink Louis XIII from your pocket-chalice, this study isn’t for you. But unless you’re the sniff, swirl and spit type, when presented with two roughly similar glasses of wine, chances are you’ll order the cheaper option. It’s just a fact: Most of us middle-class plebians are at least somewhat sensitive to price—and few things rack up as quickly as a bar tab. Lots of publications out there purport to name the best drinking cities in the country, but even the most bespoke cocktail from a Van Ness–mustachioed bartender tastes sour going down the gullet at 25 bucks a pop. With that in mind, we at Wanderu set out to identify the cheapest and most expensive drinking cities. For the purposes of this study, we focused on destinations in the United States (although if you’re curious to learn about the cheapest and most expensive European capitals, we have that study, too). With this information in hand, no matter where you choose to get gazeboed, you’ll be able to do so with eyes (and wallet) wide open. and the total number of cheap, high-quality bars. Now, please hold back our hair as we regurgitate the details. Wichita, Kansas (aka “Cowtown,” aka “The Air Capital of the World”) takes first place, providing the biggest city in The Sunflower State with a well-earned but probably not needed third nickname of “The Cheapest Drinking City in the United States.” Its wealth of high-quality drinking establishments at reasonable prices—for wine and cocktails and beer, oh my!—makes it perfectly poised to get the best punch for your pennies. In the 1800s, Cincinnati was the largest producer of pork in the world. Today, it slides out from beneath the weight of its hog-filled history for a new mantle: the #2 cheapest drinking city in the country. Tampa, Baltimore and Arlington follow close behind to round out the top five. What constitutes a “cheapest drinking city” can depend on your values. If oblivion is your only goal, you could just buy a 30-pack of Natty Ice from a gas station. But we’re going to presume you have a little more self-respect than that, which is why quality does play a factor in our rankings. 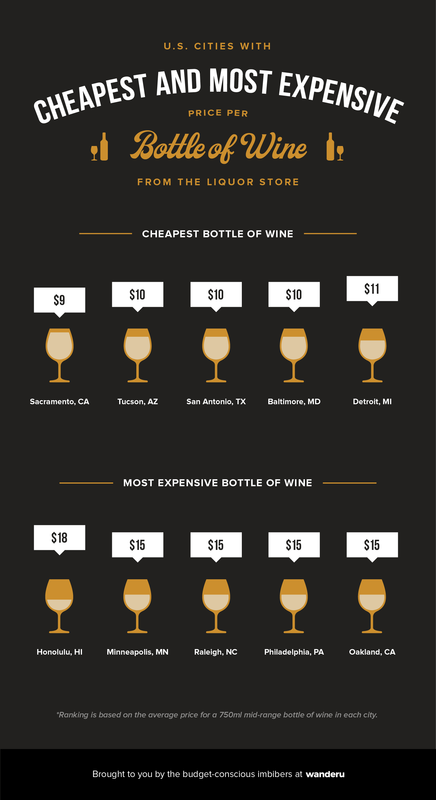 Rolled into the overall rankings are the average price in each city for a variety of beverage types: wine, beer, cocktails. If you’re a one-drink pony like James Bond and all you ever order are vodka martinis (shaken, not stirred), then the comprehensive rankings probably matter less to you than the specific category breakdowns below. Also worth noting—while we started with the 75 most populous U.S. cities, only 55 appear on the final map. Data was missing here and there for the absent 20, making it impossible to make an appletinis-to-appletinis comparison with the other cities for which all data was available. What follows is a breakdown for how each of these cities rank by category. Cocktails come out to the most expensive dollars-per-drink of the beverages included in our data set. The high price tag is in part because of the cost of liquor, but where you really get reamed is in the markup. And the king of overpriced cocktails is the noble nightclub—which is why we used their prices for our comparison. Tied for most economical cocktails in the country are Arlington, Texas—a suburb sandwiched between Dallas and Fort Worth—and, once again, Wichita. (Toto, I’ve a feeling we need to go to Kansas.) Under-appreciated boozing hubs Louisville, Tulsa and El Paso crowd the podium for second cheapest. Meanwhile, N.Y.C. and Miami top out on the other end of the spectrum, which should come as no surprise to anyone who has ordered a gin and tonic in Manhattan or South Beach and then had to refinance their student loans after receiving the bill. The next tier—which consists of L.A., Chicago and San Francisco—are $2 less on average, only serving to emphasize the highway robbery taking place in Gotham and the 305. Andre the Giant was a famous wrestler in the 70s and 80s known for his almost extra-terrestrial height (7’4”), weight (520 lbs) and prolific drinking prowess. It’s rumored that he once consumed 156 (!) pint-sized beers in a single outing. Which, in Wichita, would set you back just $589.68 at a neighborhood bar. For some perspective, in San Jose, that same quantity would run you $1,248. The moral of this story (we guess?) is that if you plan to drink at volume (though not at Andre levels—you would be dead), it’ll be better for your bank account if you do so in Middle America rather than on a coast (especially the Bay Area, which is particularly brutal). It’s tricky to track the price of wine, because it can range so dramatically depending on the type and the region of origin. For consistency’s sake, we opted to examine the average cost of a mid-range 750 ml bottle you’d buy at the liquor store or supermarket, because sometimes being on a budget means boozing back home—or at the AirBnB, a BYOB restaurant or the parking lot of a closed KMart (🎶I’m off the deep eeeeend, watch as I dive iiiiiin…🎶). Sacramento snags the number one spot as our cheapest city for a bottle of wine, possibly because of its closeness to California’s wine region without the metropolis markup of San Francisco. Both Tucson and San Antonio also make their sole appearance in the top five in this category. The ingredients that make up a first-rate drinking city extend beyond its nightlife. Day-drinking is an art: Just ask Vincent Van Gogh, who would paint outside in the sun while tanked on absinthe. For this category, we chose to look at the average price of a bottle of domestic beer from the liquor store or supermarket. Partaking at the pool or beach is about longevity. (After all, you don’t want Chad to pass out in the deep end again.) Savvy inebriates purchase domestics—your Bud Light, your Pabst, your High Life—to sip in the sun instead of spendy imports or that high-ABV craft nonsense. If you’re a lush living in the Midwest, rejoice once more: Cincinnati takes top honors with domestic beer averaging just $1.16 per bottle. If you’re mathematically challenged like us, that comes out to $6.96 a 6-pack or $13.92 per 12-pack. Meanwhile, on the other side of the spectrum, D.C. is averaging $3.17 per bottle, so $19.02 per 6-pack and $38.04 per 12-pack—that price driven up by demand from exasperated politicians thirsty for an alcoholic escape. Sure, when you wake up the morning (afternoon) after a rager and realize you dropped $200 on a bar tab, you can blame it on the al-al-al-al-al-alcohol, but that won’t put the Benjamins back in your pocket. So just go to a reasonable bar in the first place. 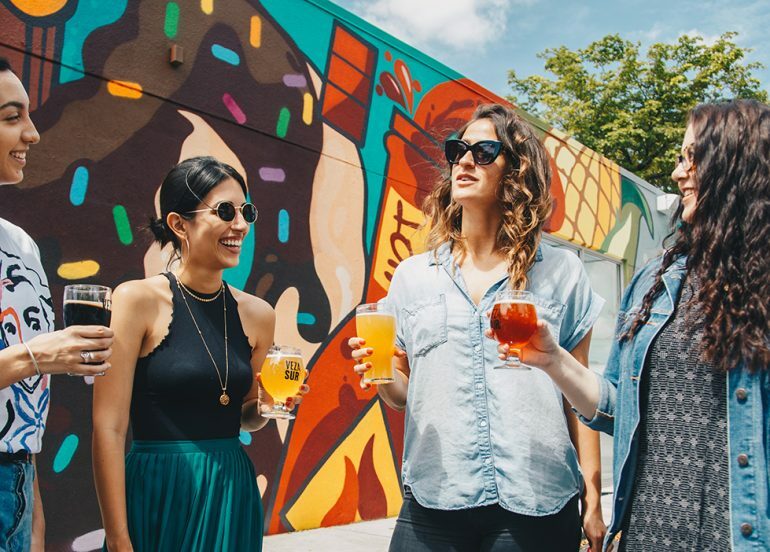 From first-class dives to budget-friendly taprooms, the cities in this category are thick with cheapo watering holes that you’ll actually want to visit (e.g., the toilets aren’t perpetually clogged, the pool table still has all 16 balls and it’s not frequented by the Hell’s Angels). Thanks to the sheer volume of establishments, this is where your cultural capitals like New York City, Los Angeles and Chicago tend to shine. But also notice the powerful presence of the Pacific Northwest, with Seattle and Portland tied for #4, demonstrating that no amount of rain can stem the flow of cheap booze. Maybe you’re lucky enough to live somewhere in the cheaper half of these rankings. If so, that 👏 is 👏 great 👏! How’s the weather in Wichita? But conversely, if you inhabit the more expensive end of the list, or elsewhere in the murky middle, consider giving your bank account a break when planning your next vacation. Reside in our nation’s capital but don’t want to blow your paycheck on a single night out? Maybe a cheap train from D.C. to Baltimore is in order. Organizing a bachelor or bachelorette party on a budget? Places like Phoenix, New Orleans and Chicago may be more affordable drinking destinations than Las Vegas, Miami or San Francisco. No matter your travel plans, Wanderu can provide a cost-effective option. Compare routes, schedules and prices on bus and train fares across the country, and book your tickets on a single platform without paying a premium. Simply download the Wanderu app or visit Wanderu.com to start your search. So, where to? The world is your oyster shooter! After all, it matters not if your glass if half empty or half full—clearly there’s room for more. For population, we pulled the 75 most populous cities in the U.S. from a 2019 World Population Review based on recent U.S. census estimates. 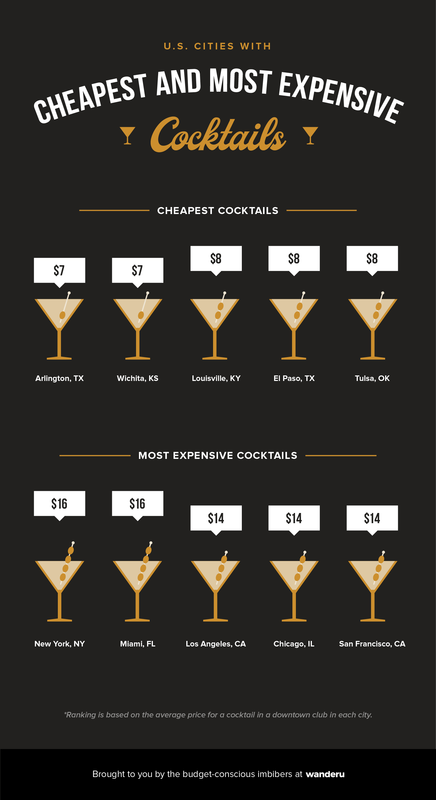 For cheapest cocktails, we looked at the average price of a cocktail at a downtown club for each city, using the data available on Expatistan.com. 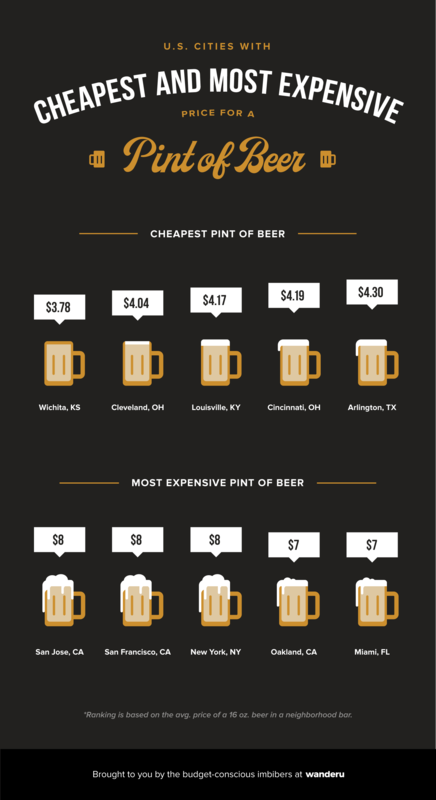 For cheapest pint of beer, we looked at the average price of a pint in a neighborhood bar for each city, using the data available on Expatistan.com. For cheapest bottle of wine, we looked at the average price of a mid-range 750-ml bottle of store-bought wine for each city, using the cost-of-living calculator on Numbeo.com. 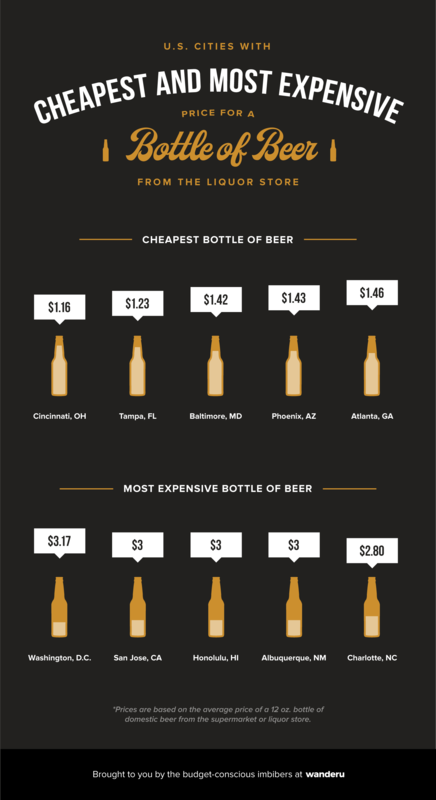 For cheapest bottle of beer, we looked at the average price of a 12-oz bottle of store-bought domestic beer for each city, using the cost-of-living calculator on Numbeo.com. For most cheap, high-quality bars, we looked up the total number of bars rated 4 stars or higher and with no more than $$ on Yelp for each city. After collecting and analyzing the numbers, we normalized them for each individual category. We then cut 20 of the original 75 cities from our rankings because they lacked complete data. 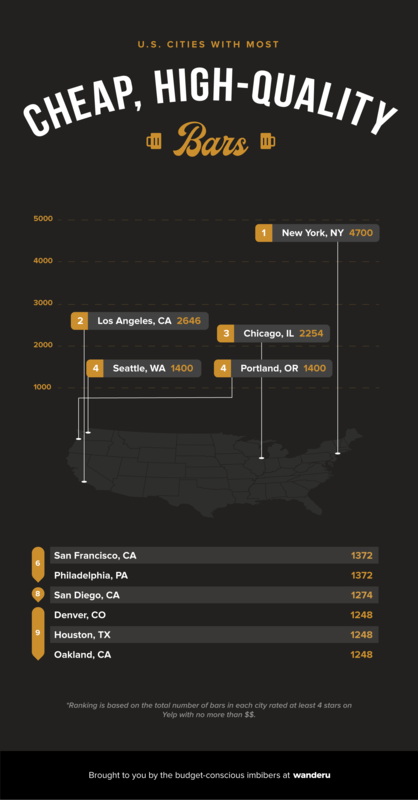 Finally, we combined the category scores into an overall score to rank all 55 remaining cities on a 1- to 100-point overall scale from cheapest to most expensive, and plotted them on a map. You are welcome to use the information and graphics on this page, crediting Wanderu. If you do so, please link back to this page, so that booze enthusiasts around the world can see all the data and find out how we came up with the rankings.